I GREW UP WITH JANET ! Well, didn't we all? Actually, I grew up with the Jackson Five. "I Want You Back" hit the charts in the sixth grade. But this isn't about the Brothers Jackson. This is about the little sister that grew up in their shadow, caught up in the world wide fame and fortune that followed them in the years to come. The little Mae West impersonator has become a driving force in music. It doesn't get any funkier, any sexier, or any hipper than Ms Jackson. She has the formula: Sweet vocals over a thick, meaty, sub-basement bass line, anchored by a beat that still takes a cue from "That's The Way Love Goes": That is, it's a little slower than what you would normally dance to, but it's a groove all her own. Then she picks up the pace, adds the hardest rock elements at will.... Janjan makes you want to move! It's good to see little Penny from Good Times (yes, I saw the shows when they first aired on TV in 1974) get her act together. That crush her character had on J.J. had me worried. I thought the poor child was BLIND! "Janet always wanted to hang out with me and followed me around constantly between filming on the set of 'Good Times'. Of course, me being the big star at the time, I would say 'Yeah right, excuse me....' and blow her off. Now I try to see her, you know, stop by the dressing room when she's on tour and say 'Hey Janet, how you doing, it's me, Jimmie!' and she says 'Yeah, right, excuse me...' "
Time goes on, and Janet is now cruising at the level Madonna was a few years ago, handling tremendous fame and fortune pressures with complete creative and business control over her music, her tour, and her future. It must be great. She is carrying the torch of the family, the first group of black men so young, they filled a role never before done so well at that age. Time flies! now Janet is over 30! Still she blazes her own trail. You must admit, her days on "Diff'rent Strokes", and then "Fame" and even the first two albums, they are just too cute. The timid, blushing, shoulder shrugging Janet is still inside. "We used to hang out during the time Janet was on the show. The first time she took me to her house, the family estate in Encino, Michael was still living there. He would be walking around, singing to himself, working on lyrics for his next album. Of course, little did I know that next album was "Thriller !". Growing up in the spotlight must have been hard enough for the Jackson boys, they were the Beatles of their (and my) generation, in a sense. That may make some rock and roll purists laugh but that's alright. There is snobbery everywhere. I heard someone say they are a first family, of sorts. I was really surprised that the TV movie about them showed so much stress and struggle within the Jackson walls as it did. I always thought of the real-life Cosbys as the perfect family. That's because Bill Cosby worked so hard to keep personal matters private. Anyway, the video the Jackson family made for "2300 Jackson Street" looked back on the family's legacy. Even with all the turmoil they've faced, they still spark some pride in me. You know what I would like to see? It's the craziest thing, really... I would like to see Janet, some how bring Latoya back into this galaxy. I mean, it has to be stated plainly, Latoya is in a bizarre existence, and the advice she's had to this point, along with the current company she keeps is not helping. Latoya seems to want validation so desperately, and she is willing to be in denial as long as its necessary, and to travel the world to any venue to find it. I would hate to see some tragic senario develop if she comes to realize it's pretty much a fantasy lost. I'm no Tito, but in those early days, the Jacksons seemed like family to me.... they represented Black musical talent at a younger age than anyone had before. Janet has the torch now, and she's running with it like Flo Jo. 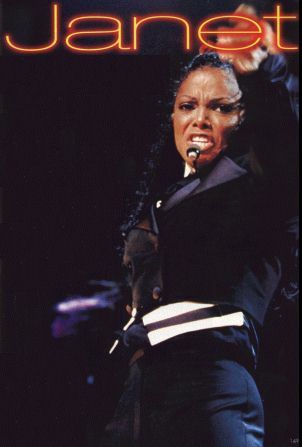 It would do Latoya a world of good if she could make a cameo appearance or so on tour, maybe even do a duet. Jan could write a song about sisters, and make a video. I'm sure the legal mumbo-jumbo can be worked out, can't it? Click here to go to my lightweight review of The Velvet Rope that I left on Amazon.com It was a while ago, so you have to scroll way down to June 29th "Andre33", and check it out, then leave your own two cents. The latest news flash is that Janet and Rene have parted ways, have come to the end of their road, that the thrill is gone, the ship has sailed, and the horses have left the barn. Well, if you consider the insane atmosphere of most of the entertainment industry, this relationship did last longer than most. She is the famous one, so the urge is strong to consider him the flake. Just like in the Hallie Berry and David Justice break up, the brothers must be saying, "How bad could it be, man ?!!" I mean, hey, if she wants you to do the dishes, DO THEM!! What else could be the problem? 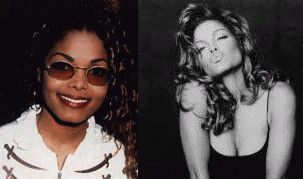 Just keep reminding yourself when you start to get big head..."She's Janet Jackson!" Or remember the lyrics to TLC's "Baby baby baby": ..."I could have anyone I want to, that's actual and factual...". After so many years together, they must have found some differences that they considered irreconcilable. I hope the reports from the Enquirer are not accurate. As much as people rag on in Enquirer and the Star for sensationalism, ever since the OJ trial news scoops they kept coming up with, they have gained more respect for their ability to get the inside story no matter how unpopular it is, and even if they do pay people for it. I won't repeat the rumors here though. If you have been to a super market line in the last month, you can't miss the headlines, so you should know. Janet will weather this break up just fine. I am sure she was smart enough to protect herself financially, growing up Jackson has made her battle-tough emotionally.